The Potez 630 and its derivatives were a family of multi-role twin-engined aircraft developed for the Armée de l'Air in the late 1930s. The design was a contemporary of the British Bristol Blenheim and the German Messerschmitt Bf 110. The original Potez 630 three seat, twin engined heavy fighter was built to meet the requirements of a 1934 specification which also resulted in the successful Breguet 690 series of attack aircraft. The prototype first flew in 1936 and proved to have excellent handling qualities and an order for 80 was placed in 1937. Simultaneously 140 Potez 631 C.3 fighters were ordered, these having Gnome-Rhône 14M radial engines rather than the unreliable Hispano-Suiza 14AB 10/11 of the Potez 630. Fifty additional Potez 631s were ordered in 1938 of which 20 were diverted to Finland, although they never reached that country. 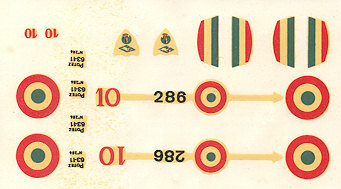 More than 700 Potez 63.11 were delivered by June 1940, of which more than 220 were destroyed or abandoned, despite the addition of extra machine gun armament; the heaviest losses of any French type. The Potez 63.11 continued in service with the Vichy air force and with the Free French forces in North Africa seeing action with both. Production was resumed under German control and significant numbers appear to have been impressed by the Germans, mostly in liaison and training roles. All members of the family (possibly except the Potez 637) shared pleasant flying characteristics. They were well designed for easy maintenance and later models had a heavy armament for the time (up to 12 light machine guns for the Potez 63.11). They were also quite attractive aircraft. Although not heavily built they proved capable of absorbing considerable battle damage. Unfortunately the Potez 63 family, like many French aircraft of the time, simply did not have sufficiently powerful engines to endow them with an adequate performance. In the stern test of war they proved easy meat for prowling Messerschmitts, like their British contemporaries the Fairey Battle and Bristol Blenheim. Their similarity to the Bf 110 (twin engines, twin tail, long "glasshouse" canopy) was sufficient that some were apparently lost to "friendly fire". Molded in their standard grey plastic, this is one of Heller's early kits. It has nicely raised detailing, but many of the larger parts suffer from sink areas and depressions, especially near the alignment pins. The cockpit area is well appointed with seats, sticks, instrument panels and bulkhead. There is an observer's seat and a gunner's seat included. Glazings are nicely molded, though a tad thick and include wing tip light pieces. Engines are simple faces with separate push rod piece that fit into a two-piece cowling that is split horizontally along a panel line. The kit's landing gear is quite a complex looking construct. An additional diagram is provided to help with getting things properly aligned. My kit was missing a mud guard so I'll be leaving that off. The tailplane has both sides of the elevator molded on one piece, making for a nice, sharp trailing edge. the kit includes an underbody gun pack. Instructions are in French, though an English addendum sheet is provided. 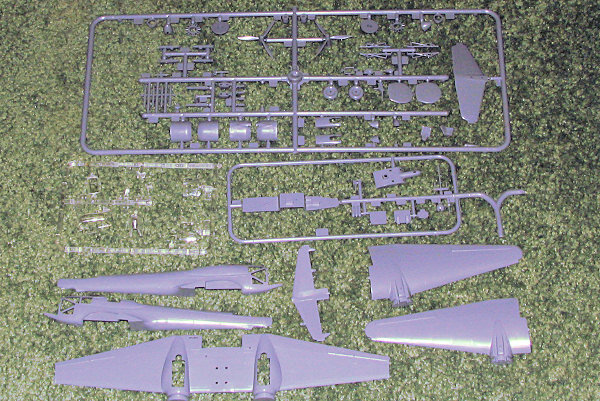 It is typical Heller with an exploded view showing all the parts and their location. Markings are provided for one aircraft, but in my kit, these were so badly yellowed as to be pretty much unusable. The roundels are also off register. They are for a single aircraft of an unknown unit. If anyone can help out with usable markings for this plane, that would be much appreciated. I have built a number of these very old Heller kits. The fit is fair, though one will need some modeling skills and filler. The subject is one that I don't think has been kitted before or since and makes for an interesting addition to anyone's collection. Late note: I've been informed that Azure/Special Hobby has done this one in the last year or so.